The ASPIRE Science Scholarships are open till 12noon Monday 15 September 2014. Welcome to the archive of ASPIREfest2013 – Thank you Dr Karl for visiting Carnarvon! This is the largest science themed festival held in the Gascoyne region and will headline Dr Karl Kruszelnicki from Triple J. It merges the efforts of the successful ‘Carnarvon Astrofest’ and the ‘Carnarvon Science and Innovation Festival’. 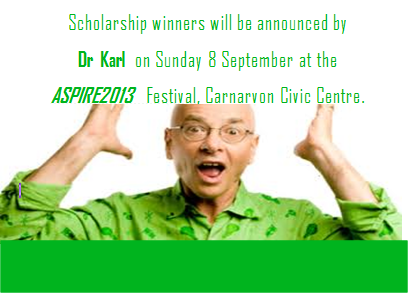 The festival starts at 4pm on Sunday 8 September and Dr Karl will start his special presentation at 4.30pm sharp – come along early and secure your seat at the Carnarvon Civic Centre Theatre. 1. ASPIRE2013 Innovation Night – 6pm Fri 31 May at the Yacht Club – talk and launch of free innovation info kits. 2. ASPIRE2013 Science Scholarship Program Launch – 6-7pm Fri 25 July – Venue Gwoonwardu Mia – Gascoyne Aboriginal Heritage & Cultural Centre – Launch by the Chief Scientist Prof Lyn Beazley AO FTSE. 3. 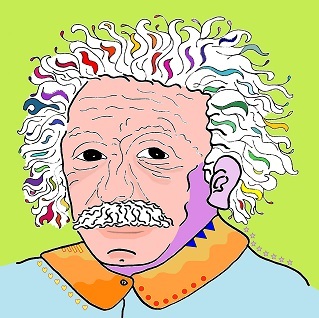 ASPIRE2013 Science Week Quiz Night – 7pm Fri 16 August – Woolshed – Purpose is to raise funds for the science scholarship program. 4. ASPIRE2013 Festival – FREE entry to all events. Saturday 7 September – Carnarvon Civic Centre – ASPIRE2013 Horizon Power Energy Free Science Tours. Two tours departs 9.30am + 11.30am. 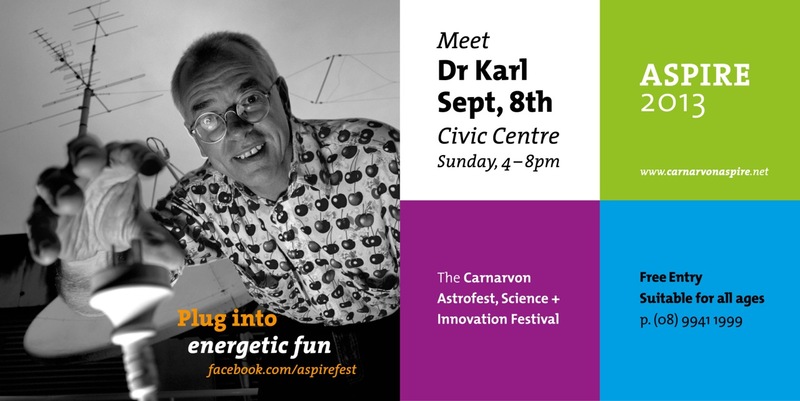 Sunday 8 September 4 – 8pm – Carnarvon Civic Centre – Dr Karl special guest. 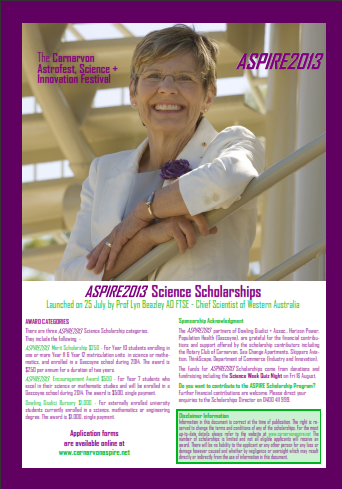 There are three ASPIRE2013 Science Scholarship categories. ASPIRE2013 Merit Scholarship $250 - For Year 10 students enrolling in one or more Year 11 & Year 12 matriculation units in science or mathematics, and enrolled in a Gascoyne school during 2014. The award is $250 per annum for a duration of two years. ASPIRE2013 Encouragement Award $500 - For Year 7 students who excel in their science or mathematic studies and will be enrolled in a Gascoyne school during 2014. The award is $500, single payment. Dowling Giudici Bursary $1,000 - For externally enrolled university students currently enrolled in a science, mathematics or engineering degree. The award is $1,000 single payment. Offering scholarships is a way for individuals or communities to show support for excellence and perseverance in learning. They show respect and encouragement to students who aspire to knowledge and understanding. Scholarships are a sum of money awarded to a student to assist them financially with their study. They are presented to applicants who show evidence of meeting requirements such as academic performance, work experience or community contributions, and persistent effort. Scholarships have different closing dates and eligibility criteria. These must be checked carefully before completing the application form. Normally, there is also the requirement to provide additional documentation as proof of statements made in the application, for example a certified copy of academic record. Only students that are resident in the Gascoyne Region while studying are eligible to apply for the ASPIRE2013 Science Scholarships. Conditions apply to the payment of the award amounts which will be issued at the commencement of the 2014 academic year. Who will assess the scholarship applications? An independent panel of three assessors from outside the Gascoyne region will review the applications. They include Dr Trevor Ward, Ms Cecilia Connell and Ms Alex Grantham. Dr Trevor Ward - Adjunct Professor in the Centre for Environmental Sustainability at the University of Technology Sydney. Dr Trevor Ward is an independent marine ecologist specialising in performance assessment systems for marine ecosystems and biodiversity. He has published more than 140 scientific journal papers, book chapters and research reports. 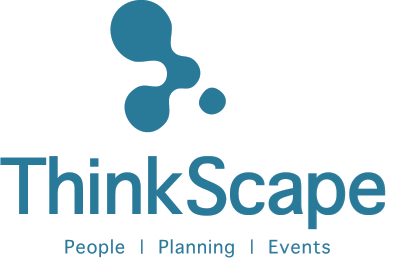 Ms Cecilia McConnell - Founding Partner at ThinkScape. Her expertise provides services in evaluation, policy and strategic planning services across Government, NFP and community sectors. Previously she was a Regional Director with the Department of Agriculture and Food. She has a science background in fluvial geomorphology and has worked in salinity research within Western Australia. Ms Alex Grantham – Inaugural Director of Commove; specialising in regional development projects across Australia using network practices and facilitation techniques. Alex is a Communications graduate of the Royal Melbourne Institute of Technology. She has worked extensively in community service and project management. Currently, Alex is in NSW pursuing regional development initiatives. 1. A non-refundable application fee of $20 applies to each application. 3. The same Application is sufficient to be considered for all selected awards. (c) an itemised budget of how the award money will be spent, where applicable. (b) an academic reference from your school Principal or Science or Mathematics teacher. (b) two referees and request each referee to email a reference to the Scholarship Liaison Officer at the ASPIRE2013 office at scholarships@carnarvonaspire.net before the closing date. It is the responsibility of the applicant to check that references have been sent and received in time. Referees’ reports will be verified. (b) Outline details of your research topic. 8. It is the Applicant or Applicants’ Guardians responsibility to check and confirm, before the date and time of closing, that the emailed application has been received successfully at the ASPIRE office. The decision of the ASPIRE2013 Scholarships panel is final and no further correspondence will be entered into. The scholarships will be awarded on the ground of academic distinction. These awards are to fund a special academic purpose which will assist the student to enhance the quality of their science or maths learning. The ASPIRE2013 partners reserve the right not to make an award or to award less than the applicant has requested. The ASPIRE2013 partners of Dowling Giudici + Assoc., Horizon Power, Population Health (Gascoyne), are grateful for the financial contributions and support offered by the scholarship contributors including the Rotary Club of Carnarvon, Sea Change Apartments, Skippers Aviation, ThinkScape, Department of Commerce (Industry and Innovation). The funds for ASPIRE2013 Scholarships come from donations and fundraising including the Science Week Quiz Night on Fri 16 August. Do you want to contribute to the ASPIRE Scholarship Program? Further financial contributions are welcome. 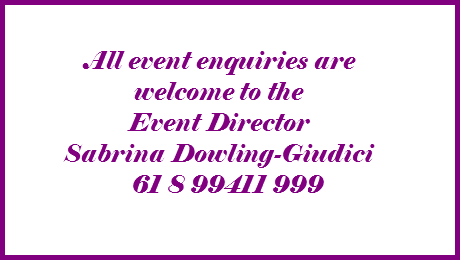 Please direct your enquiries to the Scholarships Director on 0400 411 999. Information in this document is correct at the time of publication. The right is reserved to change the terms and conditions of any of the scholarships. For the most up-to-date details always refer to the website at www.carnarvonaspire.net The number of scholarships is limited and not all eligible applicants will receive an award. There will be no liability to the applicant or any other person for any loss or damage however caused and whether by negligence or oversight which may result directly or indirectly from the use of information in this document. DG+A are the founding supporters for the ‘Local Universities Centre’ program for remote-area students in Australia.